The International Air Transport Association (IATA) laid out a transformative vision for air travel that will enable aviation to successfully accommodate a near doubling in demand for air travel over the next two decades. According to IATA’s latest passenger forecast, some 7.2 billion air trips will take place in 2035, up from 3.8 billion in 2016. 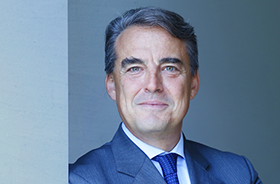 “My dream journey through the airport would offer security processes that are both effective and convenient, constant communication that makes me aware of changes to my journey or opportunities nearby, and a more efficient way of identifying myself to the airline, security staff and border management,” said Alexandre de Juniac, IATA’s Director General and CEO. Smart Security, a joint initiative with Airports Council International (ACI) to make airport security checkpoints more efficient and less intrusive. It is making inroads in Europe and the first US airport—Hartsfield Atlanta International Airport—just joined the program. The New Distribution Capability (NDC), which will change how consumers shop for air travel by enabling travel agents to have access to products and services currently available only on airline websites owing to technology limitations. Already 26 airlines have implemented a part of the NDC standard. ONE Order will build on the capabilities of NDC to enable airlines to replace the multiple rigid and paper-based booking and ticketing records by combining the contents into a single and flexible order record. It will eliminate the need for passengers to juggle different reference numbers and documents along their journeys. Real-Time Interaction aims to provide customers with trusted, accurate real-time information from all travel service providers throughout their journey. One Identity is a visionary concept that would allow an air traveler to assert their identity just once, eliminating repetitive ID checks at security, border control and the gate. De Juniac warned, however, that “no matter how much or how quickly we innovate our processes, there is no getting around the need to be both smart and quick in growing airport and airspace capacity.” He cited rising congestion, particularly in Europe, while noting that fast growing areas including the Gulf region and China also face airspace capacity issues. “I fear that we may be headed for an infrastructure crisis that will impact air travelers,” said de Juniac. De Juniac cited the recent historic agreement among member states of the International Civil Aviation Organization (ICAO) to enable aviation to grow sustainably as an example of what can be achieved by working together. Read Alexandre de Juniac’s speech .